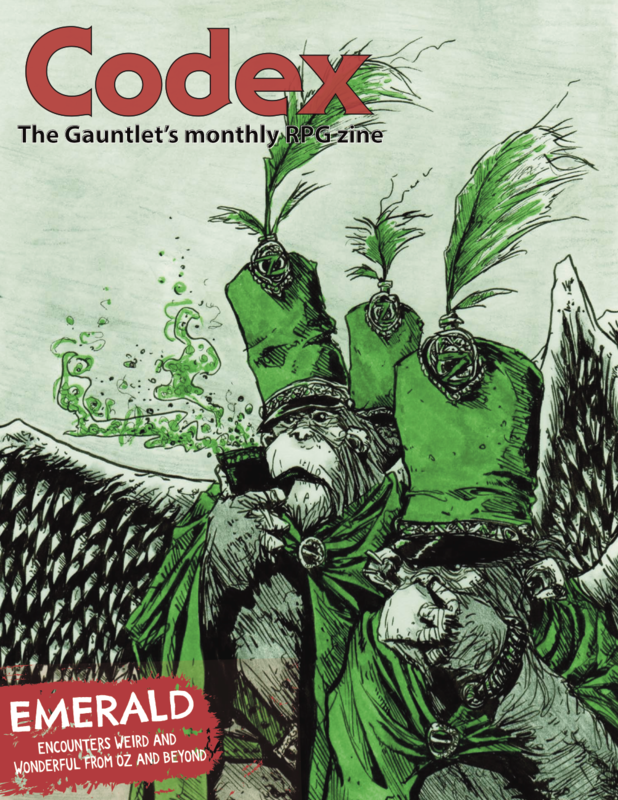 Codex is the Gauntlet's monthly RPG fanzine. Each issue is packed with awesome game material sourced directly from our community, as well as original art. Emerald City Drama Club, a surreal new framework for Monsterhearts 2. The Harpy, a new skin for Monsterhearts 2. Dark Designs in Verdigris, an original game set in the Emerald City's seedy underbelly. Doolhoven, an 18-page supplement for Dungeon World that explores a lost dwarven civilization. A new supplement for Trophy, the groundbreaking game of psychological horror and dark fantasy. Three Dozen Jeweled Treasures (Allegedly Blessed or Cursed), a miscellany. Custom layouts by Jake Householder and Jesse Ross. How do I get future issues? Future issues of Codex will be available as pledge rewards for supporting the Gauntlet's Patreon. The current issue available for patrons is Codex - Sunlight. If you have any questions, or are interested in contributing, please drop us a line at gauntletpublish@gmail.com. Where can I get back issues? Codex back issues can be found on DriveThruRPG. Back issues can be purchased individually, or you can get Volume 1, including the Discern Realities Annual, in a reduced-price bundle.